This wacky themed bouncy castle can also be used as a ball pool. It’s perfectly sized to fit into most back gardens and has been recently safety tested so you can rest assured your little bouncers are in good hands. This inflatable is only suitable for children – no adults allowed! The blower for the bouncy castle needs to plug into a standard electric socket. If the nearest one is over 50m away you will need to use a generator or petrol blower, which can be booked at an additional cost. You can add this onto your order when you book, or give us a ring on 07944 487 578 to discuss this further. We will bring extension cables for you to use free of charge, and these are usually plugged into the house or garage to power the blowers. If you are booking multiple units in a field, we recommend hiring one of our generators or petrol blowers, or giving us a call to discuss your optionsr. If it starts raining while you're using the castle, you can leave it inflated unless the wind becomes very strong. This will allow the air to blow water from the castle, drying it out quickly. Once the castle has been deflated in the rain, water will go through the seams and flood the castle, taking longer to dry. 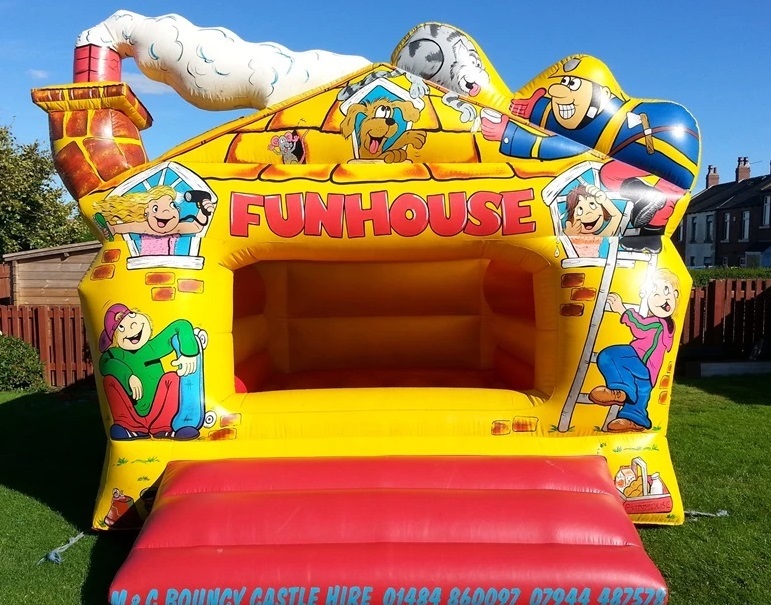 Be sure to wipe the castle over with an old towel once the rain stops to remove any surface water, giving extra care to the steps as these can become slippery when wet..
Our Fun House bouncy castle can also be used as a ball pool. If you would like to book balls with your order, we recommend booking through this link, as it is a package deal. Please make sure to pick up all the balls before we arrive to collect the castle.